Highway One-O-One or the PCH (Pacific Coast Highway) runs along the Californian coast all the way from San Francisco to San Diego. And it’s one of the most scenic drives one can possibly imagine! Even though it was quite tiresome to drive the whole length of it on my own, I am really happy I chose to make this trip! For every road trip you have to have a car, so I had rented one for the next couple of days. Unfortunately, I had to pick it up at the airport and it took me more than 2 hours on the public busses to get there, as the bus got stuck in a traffic jam – phew, was I really really happy that I didn’t have to catch a flight! When I finally got to the airport I was handed the keys to a nice blue Nissan Versa and the two of us started off our adventure down the coast! So I got back on the road early the next morning and drove back to Half Moon Bay and to the wave which is called Mavericks and supposedly one of the most dangerous waves ever surfed. Finding the wave is a little bit hard, as it sits outside in the ocean, behind the tip of a spit of land, which tip is fenced off by the American army so one has to find his way around it to sneak a view at the wave. But once one has climbed the steep cliff to the South of the army area, one is rewarded with a good view of the wave and the rocks right in front of it. Even though a decent sized swell had been predicted for the day, from so far away, Mavericks seemed quite small. This impression was corrected, however, when I made out two lonely surfers attempting to actually ride down the face of this giant wave. No, it wasn’t small at all, and the fact that it pretty much breaks right in front of some massive rocks, made me shiver. I stayed and watched the surfers wait for their next wave with anticipation and saw some good sets break. After two hours it was time for me to get back on the road and drive on. The road soon started winding along the coast and ever so often I pulled over to my right and got out of the car to take pictures of the amazing coast until I finally arrived in Monterey, my next overnight stop. Monterey with its Cannery Wharf and boardwalk along the shore is an interesting city with some history to be told. The Canneries where once actually the centre of the sardines industry and a lot of immigrants came here to make a living of the canned fish – however, with the production rocketing through the sky, soon the seas became overfished and the industry dwindled down, killing itself. Nowadays, Monterey is a nice spot for tourists driving down the Pacific Highway, even though quite pricey. I hiked through a redwood forest, some of the biggest and oldest trees I have ever seen, to a nice little waterfall and had a picknick lunch there. After this, I returned to the car and drove a short distance to the Julia Pfeiffer Burns State Park, where after another short hike, I saw a waterfall crash down right onto the beach and into the wild ocean waves crashing into the little bay. 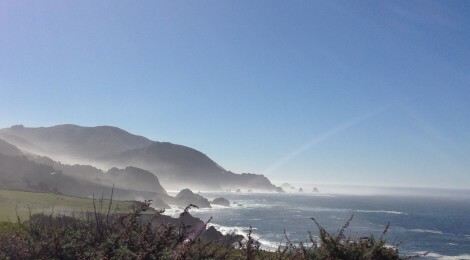 After this break I got back behind the wheel and drove on towards San Simeon. Just a few miles before the little settlement (one can hardly call the few motels along the road a village or town), I stopped at Piedras Blancas, an elephant seal rookery and once again it was perfect timing, as it was just pupping season and the whole beach was literally covered with elephant seals and their little pups, squeaking for their moms and their mothers bellowing at other mothers or some males that were coming too close to their pup. It was a loud mess and I think that elephant seals are actually one of the few animals where the females are better looking than the males as those look kind of stupid with their big hanging noses that explain the ‘elephant’ in their name as is bears a strong resemblance to the trunk of their namesakes. In the fading light of another beautiful sunset, the elephant seals almost looked like massive rocks covering the whole beach. After the sun went down, I got back into the car and drove into a wall of fog which had developed quite quickly and I almost missed the little settlement of motels along the road. However, once I had found mine, I was relieved I had made the day’s drive all the way and fell into bed very happy but also very exhausted. My next stop was Santa Barbara and I wanted to get there quite early, as once again perfect timing, it would be the final’s day of the local surf competition, the Rincon Classic. However, I did make a lunch stop in Solvang, a little village nested into the hilly landscape of wineries. Solvang is a cute little town, but it seems quite out of place in the middle of California with all its Scandinavian shops and flags. However, it was a nice stop and if one is into wines, I’m pretty sure the area around Solvang has some nice wineries for wine tasting. But anybody who knows me, knows that I am 1000 times more likely to be found at a beach than a winery, which is why I headed down to Rincon! And to see the perfect wave of Rincon was great, but to see the Rincon Classic with some good surf action (especially from the groms!) was even more amazing. When I got there, it was hard to find a parking lot, but with some patience and a lot of luck, I finally got the perfect spot, and when I got down to the water, there were just then some Dolphins passing by – what a nice welcome!!! And when I saw Rincon and its perfect right handers wrapping around the tip and peeling down all along into the bay I instantly wished I was traveling with a surfboard! Every wave just seemed to be perfect and I swear I will go back to California just to surf Rincon, the queen of waves! When I got back to Santa Barbara, I checked in to one of the worst hostels I have ever been to before – it was crowded, run down, smelly and ridiculously expensive, and the staff was not really friendly either. So if you are ever looking for accommodation in Santa Barbara, do NOT stay in the IHSP Santa Barbara, it’s a total rip-off! Anyways, I had already paid and would only stay for one night, so I knew I could survive. And to make things better, I spend as little time in the place as possible, going for a long walk along the beach all the way down to the Main Street, which is really nice with a lot of shops, bars and restaurants. I also found a hairdresser there and as my ends started to split due to all the sun, I though I would just get a quick haircut to take care of it. Unfortunately, I had my worst hairdresser experience that night! Instead of just cutting off a few centimeters so my ends wouldn’t split anymore, he took down about 5 centimeters, but definitely not the same length on both sides. On top of that he “layered” my hair, which seemed more like my hair had been cut along three different-sized pots on my head – in short it looked really awful and I could hardly look into the mirror without crying. The next day I spent another two hours at the hairdresser to have the “haircut” fixed and in the end it turned out ok but by far a lot shorter than planned. So one thing I’m certain of – never just pop in to any hairdresser but ask for a recommendation before u let anybody get close to your hair with scissors! No matter how simple the task may seem, they can definitely mess it up! Anyways, enough of my hair-drama and back to the road! The drive from Santa Barbara to LA is quite uninteresting, even though I was really excited to go and see Malibu. However, once I got there, I was more than disappointed. If you (like me) have a picture of amazing beaches, great waves, hot surfer dudes, bikini chicks and celebrities, all either sipping a cocktail or being active on a beautiful boardwalk, in mind – forget it. Malibu is a quite ugly gray road with hardly any beach access as the shoreline is blocked with houses. The famous wave that wraps around Malibu Point definitely seemed to have some potential for longboarding, but even almost flat it was pretty crowded and on top of that I didn’t see any particularly good looking or famous people. So you might still want to check it out yourself if you drive along, but don’t be too disappointed once you get there! I have seen a lot of beaches by far more beautiful and surfable than Malibu on my trip down the coast! Anyways, I drove on to LA and made one last visit to Venice Beach, then I met up with Yvette again and we had an awesome dinner at the Rock Bottom Brewery in Long Beach! We had asked our waitress what she could recommend and in the end actual ordered almost everything she had recommended to us: Mac’n’Cheese, Chicken Fried Chicken with Mash, the Chipotle Brisket Barbacoa Pizza (one of the best pizzas I’ve ever had with veggies and a delicious pineapple-BBQ sauce) and a Chicken Waldorf Salad (with apples, cranberries and blue cheese). Believe it or not – as it was sooo damn good, between the two of us we finished all of this except for two slices of pizza! Our waitress was pretty impressed with us and offered some amazing sounding deserts, but on this one we had to take a rain check – unfortunately we were too stuffed already. Nevertheless, it was a great last night with Yvette in LA and I’m sure I will see her again sometime somewhere in the world! On my last day in California I drove back to San Diego, where I packed up all my stuff and shipped my wetsuit and sleeping bag along with some clothes I knew I wouldn’t the needing anymore back to Germany. After pretty much exactly one month in California, I spent one last night in Ocean Beach and the next morning I headed back to Hawaii!